I heard the jingling of a collar last night. Throughout the house, the tag against tag. I could hear them jangling from the denim in the cadence of her jaunt, side to side, side to side. I looked outside. No dog. Certainly none inside. Back to bed, then, the jingling toward the room, side of the bed, stopped. I slept well. I can’t remember when she left. A year? Two? But I remember her eyes. And the sound of her heart. As well as I remember her gutteral moan and her whistle. The rhythm of her step. How her face fit perfectly in the curve under my knee when she leaned into me. And how she looked at me when I knew she wanted it over. Her eyes, if they had been human, could not have made them more holy. I’ll find something holy in this. The urine and sad almond eyes. And these are of the body. So I will find something holy in this. The cost in dollars and sense. In time, I’ll find something holy in this. And, certainly, there is something holy in that. There is something holy in that. I don’t know why I’m reading this tonight. Maybe it is seeing my kids after a year absent – seeing in the light of their eyes the omnipresent brightness of their mother. Maybe it is Sadie asking her questions, continuous, into the deep morning. Maybe it is part of the work of grief, the carrying of the weight in the dark to the mountain-top that is never reached. Of everything I have ever written, this is the one I think of the most. Not the longest, by far. Maybe nearly the shortest. But the one that lives on my mind. I was asked, by Murshida VA, what three things would I have someone know about grief. I took a day to answer, then three things came at one. It has no schedule. It doesn’t end, or heal. One simply incorporates it into one’s life – a wound, a laming, to which one adapts, with which one lives, from which one learns, and with which one may become stronger. It cannot be controlled, anticipated, prepared for – it will be different each time and come in different ways. I will now add a fourth. It is the price of love – never shut it away and you will be able to love more, and again, and see love in all things. Those who cannot grieve cannot return to love, cannot return to grace. I had pulled the car out of the garage and set up a chair. Months earlier I had purchased a Norelco family hair cutting kit, and electric razor and attachments, for next to nothing at a garage sale. I had no idea why, but I brought it home, and now, now, it was plugged in and ready to be used. The chemotherapy had left your hair in clumps. It fell into the shower drain, left bits on the pillow, left itself on the couch. Each bit that fell, you cried. I watched as you turned once, as I held you up in the shower to see your hair on the drain. Out of the shower, you stood, facing the mirror, clutching at your hair, pulling it out in clumps, tears falling, falling into the sink with the strands from between your fingers. When I woke this morning, I was afraid I could not write. I felt it was gone. It, whatever that is, felt absent. But during the day’s discussion, in the three minutes between classes, in moments during planning, the topic of poets came up. I found the poem “We Bring Democracy To The Fish,” by Donald Hall. Don’t blame me for the way the title is capitalized – blame Donald. Anyway, he was Laureate until that poem was published. Then he was Poet Non Grata. He and the Dixie Chicks hung out together looking for work. Distressed Haiku had this line: “I finished with April/halfway through March.” His wife, the poet Jane Kenyon, had died in the month of April, 1995. That line. That one line. I have said that myself, nearly word for word. And I was writing again. But would I ever write of anything else? I ask that, yet I have. I have. But, time and time again, I return to it. Why? Because one doesn’t go on. One doesn’t heal. One continues, with the wound. With the weight. One may be happy, one may be loved, and one may be content, one may have a wonderful life. I certainly do. But that is still there, because it is part of our lives. For those in this “club we’re in that I wouldn’t wish anyone to belong to,” as a friend of mine put it, one doesn’t go back to the old way of being, but creates a new normal around the space. Everything is made of space. So, I guess, I’m still writing about everything. I guess. Paid, at first, in wine. Daily worries of bills due. So long and thanks for all that. The newest review for my latest book, Songs from the Well. If you haven’t read it, this reviewer thinks you should. I’ve just finished Songs from the Well by Adam Byrn Tritt and I’m in awe. At the moment, I’m sitting on my recliner, holding my kindle close to my chest because I can find no other perfect place to have this story other than close to my heart. My heart is swelling with love and breaking at the same time, my eyes are tearing from admiration and sadness and I am finding it hard to concentrate on anything other than this book. This book is, hands down, 5 stars. Wow. From the very first page of Songs from the Well, I was in love. Adam Byrn Tritt’s story about his wife’s life, family and contribution to the world and everyone around her placed me in his shoes and showed me exactly why he was- and still is- absolutely head over heels in love with her. This story is packed full of sweet sentiments, hilarious stories of Adam and Adam’s wife- Lee’s- adventures, heart warming family connections and tissue worthy poetry. This book is not very long, but I’ll admit to you all, my faithful readers, that it took me three days to read. Not because it was difficult to get through, but because I wanted to savor the story. I wanted to take my time with Adam’s recollections of Lee’s life, their experiences of grief and mourning and wonderful insights for ways to look at life. Adam also writes a letter to his granddaughter about his family and their ancestors and past, which makes me envious for that rich of a family history. This author and Songs from the Well will capture your heart and fill your emotional bucket with love, friendship, laughter and sorrow. Could I? Chanting could wait, I thought. Let’s do some good in real time, right now and, what do you know, the truck had already turned into the studio parking lot. Smart truck. And I got to pick one of Lee’s favourite songs for the show. You’ll have to tune in to find which one. And I got to choose which Brevard Busking Coalition song too. NOT one Java John’s ever played before. Which one? Tune in to find out! First one to post the answer to either will win a free copy of the book. Please post the answers in the comment section here or use the contact form on the homepage of adamtritt.com. 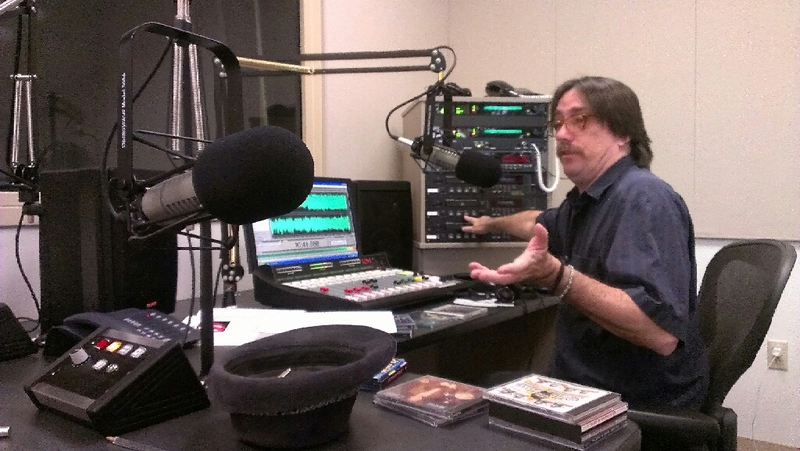 Java John doesn’t know what to say. He lost his wife, Jenn, to cancer as well. 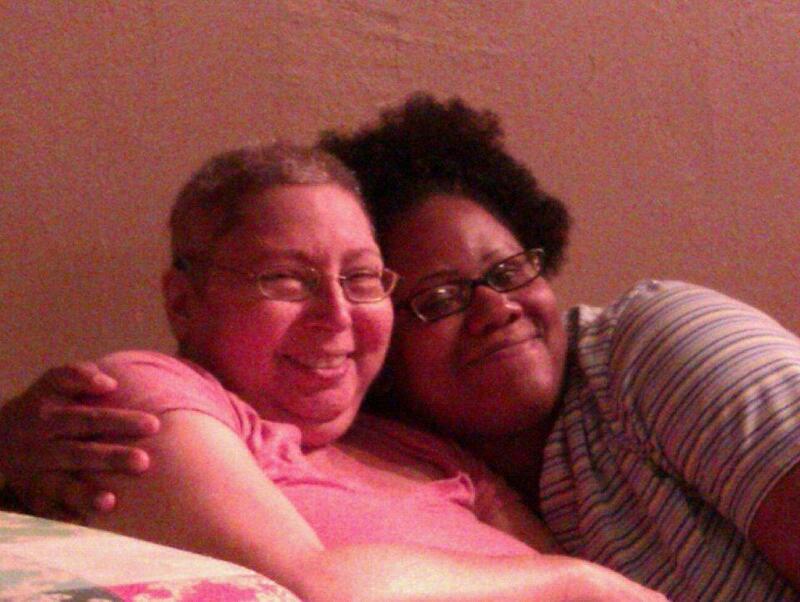 Want to do something to directly help families dealing with cancer? Struggling yourself or know someone coping with the serious illness or loss of a loved one? Have five bucks to share? 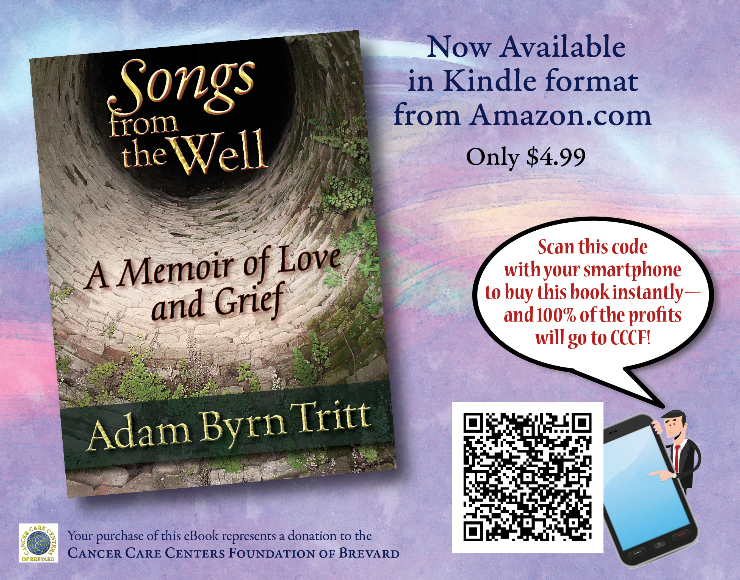 Songs from the Well: A Memoir of Love and Grief, from award-winning poet and author Adam Byrn Tritt, is the remarkable chronicle of his love for his wife, Lee, his sudden and heartbreaking loss of her to brain cancer, and his struggle to find a way back to life. It is based on essays, blog postings, and poetry that he created throughout his relationship with her and in the time since her passing. His hope is that his experiences will help others grappling with a loved one’s serious illness or loss, as well as their friends and families. 100% of the author’s proceeds from the book are being donated to the Cancer Care Centers Foundation, which helps patients and families dealing with cancer. An author must practice promotion. And be utterly shameless about it. In this case, it is easy. Songs from the Well: A Memoir of Love and Grief. Out in time for Lee, my wife’s (I cannot use the word “late”) birthday. From Amazon: Songs from the Well is a memoir, selected from the author’s writings and told in essays and poetry, of the author’s life with his wife, Lee, through her diagnosis with brain cancer and death five months later, to the aftermath of dealing with his grief and facing a life without her. 100% the profits go to the local charity, Cancer Care Center of Brevard Foundation. They do not do research or anything alike that and have no administrative costs. All the money goes to pay for things those in treatment and their families can’t afford due to their treatment. Like water bills. Gas to get to appointments.Rent.Like that.Please please help us raise fund and help those who have gone through this process, but think they are alone. So buy the book and share this link. Or just scan the QR below with your phone and it will go right to the correct page. We can celebrate her birthday with her by reading her stories. By celebrating her. And helping those who helped her when she needed it the most. And, frankly, if you don’t want to read it, buy it anyway. It is $4.95. It is an ebook. It can be read on a Kindle, or on an iPhone or Android phone with a free Kindle app or on any PC with the free Kindle program or on Amazon with their CloudReader. If it goes well, we’ll do a paperback edition as well, but, for now, ebook was the way to go to raise the funds. Don’t want to read it? Fine. it is $4.95. Download it into nothing. let is spend it electrons into the free air. But buy it. The idea is to raise money for the Foundation in Lee’s name. And as much as we can by her birthday, 4/22. And we got it out in time for her birthday. I want to see how much we can raise for them and how far we can get this. Please buy one, share this, send it out, whatever we can do to help refill their coffers and remember her birthday. Scan the QR to buy the book! 100% of the profits go to charity. Hats you didn’t like. The scarves you used have been all given away. You said you wanted your head shaved. I offered. You said no. You didn’t want me doing it. You didn’t want that to be the memory of my hand. You wanted Unena to do it. Only she would do. We were sitting on the couches in the living room. We wanted to go out, the three of us. It would be one of the last nights we would go out, you and I. Maybe second to last. But first, your hair. How did it come to this? Who once was the patient, now helping care for you. Who once you treated, now holding you up, walking with you, one of the few people you trust. And she fell in love with you. And you with she. And I with her. What a strange circumstance. You, with barely a female friend all your life—you, straight as an arrow—seemingly, obviously, so in love. And it bothered me not one bit. That a blessing of love would come to you, with so little time left, made me smile. How much bigger our hearts were now that our hearts were breaking. A folding chair in the garage. Craig’s chair. The one he left here for himself to use, unfolded, set by the open garage door. You, helped to the chair, sitting. A towel around your shoulders, on your lap. The razor plugged in. Hesitation. And she starts. I can barely look at the razor as it glides over your scalp, and look down instead. Hair falling. Falling to your lap. Falling at your feet. Falling to the floor in soft puffs, blowing as the breeze would catch it, swirling around the garage and, then, out the door. What did not swirl out of the garage, I swept out. Out, over the drive way. Out, into the grass. Let the birds have it, you said. Let them. What good to hold on? Others might have saved your hair. But we discussed it. Decided no. Let it blow. Let it sail. Let it be carried by the wind, by birdwings and raindrops. Let it become the stuff of nests, work into the soil, seeds will grow, eggs will hatch and new life will come into the world nestled in your hair, and your hair will be all around us, around me, surrounding your home, in the ground and the trees, in the water, always there, always there, like you. Always there. Some of you, always there. And the razor stopped. And all I could do was kiss your head. But I think Unena got there first. And that was OK. It was her hand that had done the deed, performed the mitzva, loosened further your already tenuous connection to this world. I have a picture of the two of you. A month later. The last time you were out. The night you made her promise to take care of me. The night you made me promise to take care of her. Your heads are pressed together. Your smile. You smiled like that when you held your granddaughter. You smiled like that when you saw me. You smiled like that when your children came to see you after long absence. In less than a month you would leave us, and I don’t think I ever saw you smile quite that big.